Meet the most powerful witches and wizards from around the world. 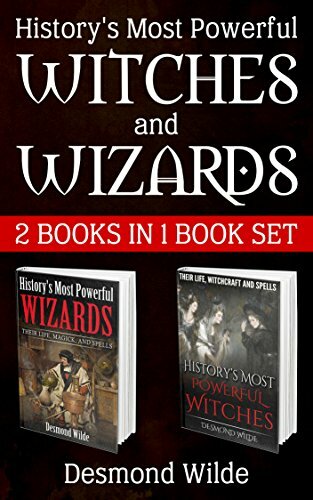 Learn about their life, their magick, how they impacted the world, and their secrets and powerful spells. Witches have always worried, scared, and fascinated people in equal measure. From dark magic to home remedies, they have been part of the cultural landscape for people across the world. From Europe to the Americas, Asia to Africa, the idea of women who delve deep into magic has created some of the most enduring stories in the history of humanity. Often, these stories blend the real with the unreal, truth with fiction, and magick with the mundane. In this book, we will look at witches from across the world and over many thousands of years. There is a tendency to view witchcraft as an inherently feminine subject. But it this entirely fair? For centuries, men have plumbed the depths of the occult and the fantastic, searching for new manners in which to employ ancient knowledge. These mystics, occultists, and wizards have sought to expand their knowledge about the universe in ways which were forbidden, untrusted, or simply unknown. These magickal men have a unique way of looking at the world and one which should certainly be celebrated. You will also discover some of the magic secrets they left behind. Not only will we provide an overview of their life and works, but we will focus on providing readers with a chance to try out magick for themselves. In every chapter, we will include a biography of the person, a reason why they should be considered among the foremost spiritualists of their day, and an example of the kind of spell work they might be associated with. If you have any interest in the occult – and especially if you wish to try this out for yourself – then this is the book for you. Read on to discover exactly how much the history of magick has been feared and cultivated over the years, as well as examples of how you can start along a path to becoming just like these men. Read on your favorite devices such as Kindle, IPad, IPhone, Android tablet and cellular phone, laptop or computer with amazon’s free Kindle reading app.